How Secular Is Your City? The religiously unaffiliated — an identity that broadly encompasses everyone from strong atheists and agnostics, to New Agers, deists, and “unchurched” Christians — make up almost a quarter of the U.S. population (22 percent to be exact). Unsurprisingly, some regions, states, and cities are more likely to be irreligious than others. The Public Religion Research Institute (PRRI) lists the major U.S. cities that have the most (and the fewest) people without formal religion. Note that the data come from the results of over 50,000 interviews across these metropolitan areas. 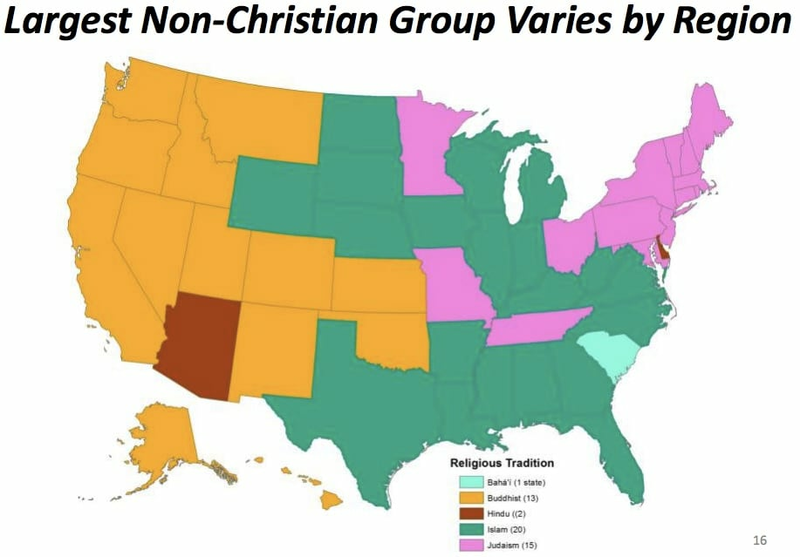 Perhaps it is little surprise that the northeastern and western parts of the country are where most of the least religious cities are located; these regions as a whole tend to be pretty secular, especially when compared to the “Bible Belt” of the south (where the least secular cities are situated). With 42 percent of its residents identifying as religiously unaffiliated, Portland occupies a space all its own. “Portlandia”, an urban mecca for eco-conscious free spirits, has substantially more unaffiliated residents than the next three most religiously unaffiliated cities, Seattle (33 percent), San Francisco (33 percent) and Denver (32 percent). Granted, by the standards of the historically devout South, 15-18 percent nonreligious is pretty high. A large part of this may have to do migration of people from the less religious northeast, a trend that began in the 1960s and ’70s and has continued to this day. Aside from the secularizing effect of these transplants, the results may also reflect the tendency for cities in general to be less religious than rural or smaller urban areas. Given the overall growth in “Nones” — those who claim no religious affiliation in Census surveys — it is likely that the percentage of irreligious people in cities across the country will continue to grow. Again, this hardly reflects the growth of atheists or agnostics per se, just in people unwilling to identify or associate with any formal religious label or institution. As for my hometown and current residence of Miami, I guess I am not too surprised that we are just around the national average. The city has a large youth population buttressed by many international and northern migrants. While Hispanics tend to be fairly religious, their children and grandchildren — like younger generations of most other demographic groups — are often less so. One of the most pervasive misconceptions about atheists is that we lack any purpose in life by virtue of not believing in a higher power (be it a monotheistic God, transcendent spiritual force, or some other supernatural entity or concept). Moreover, this lack of belief is said to not only deprive us of meaning, but also leaves us devoid of morality, happiness, and self-fulfillment — e.g. the angry, nihilistic atheist trope. As an agnostic atheist myself, I can certainly attest to this not being the case. Not only do I adhere to the values of secular humanism — which include a firm, universal commitment to promoting the flourishing of the human species — but I find purpose in the beauty and experience of life itself: art, love, discovery, creativity, compassion, and more. The joys of connecting with people, improving the lives of others, broadening my sensory and intellectual horizons — these are what drive me to enjoy every day of my finite but fortunate experience. Of course, I am but one person, so thankfully, an enterprising photographer named Chris Johnson has taken the stereotype to task by directly asking 100 atheists from where they derive joy and meaning in life. He plans to compile these answers in a book, A Better Life: 100 Atheists Speak Out on Joy and Meaning in a World without God, which will hopefully go a long way to dispelling this widely held notion. Salon has highlighted 20 of these inspiring quotes, which I have listed below. Note that most of these statements are hardly exclusive to atheists; I am sure many spiritual and religious folks can relate with the sense of wonder that is inherent in the world around us, and derive their purpose from the pursuit of knowledge, experience, and a better world. But for atheists and others who do not find meaning from a higher power , these motivations and activities are potent enough in themselves, in essence taking the place of any religious or spiritual prescriptions. I could go at length about this complex and personal topic, but as always these days, time is short, so I will leave you all to reflect on these quotes and perhaps share your own thoughts and motivations. As always, thanks for reading. 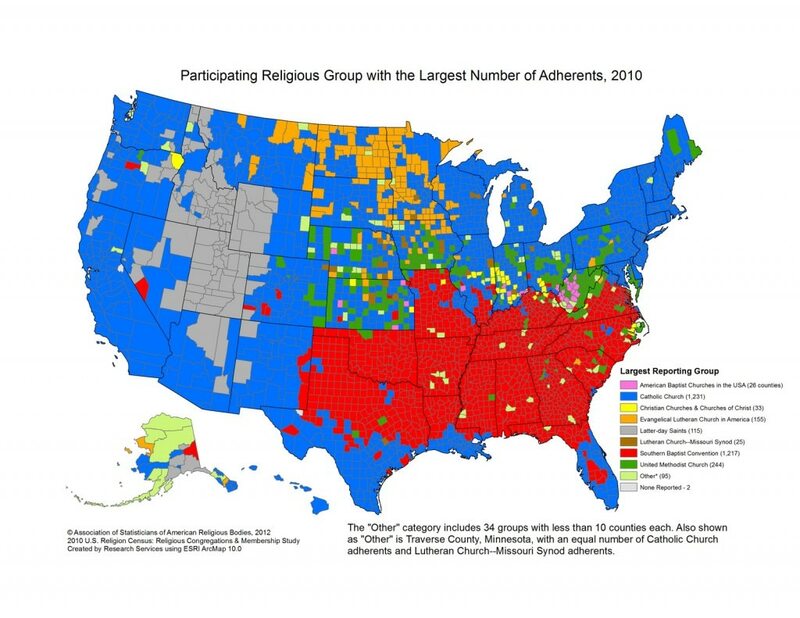 The Catholic church (blue) and Southern Baptists (red) dominate the map below, which marks the religion with the largest number of adherents in every American county. Blanketed red, the Bible Belt is alive and well. 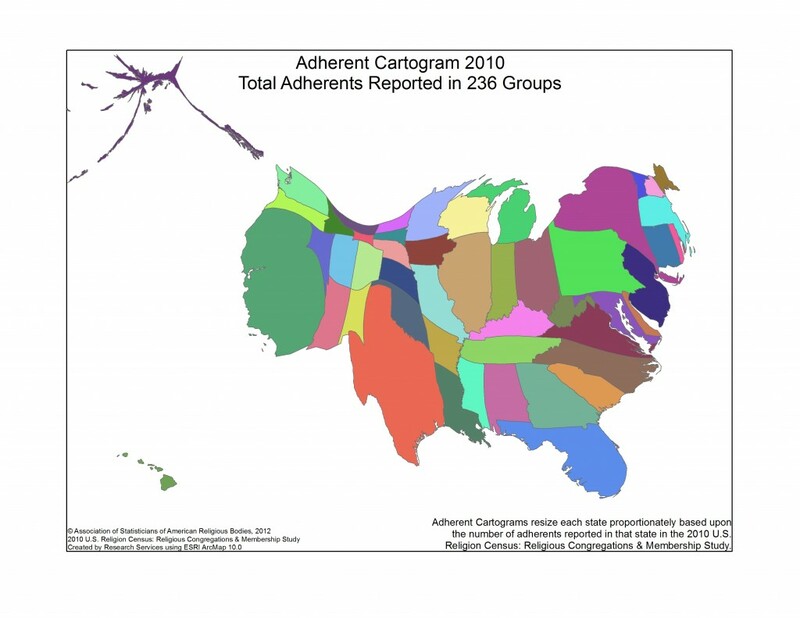 Members of the Evangelical Lutheran Church in orange can lay claim to a smattering of Midwestern and Western counties, while Mormonism (gray) is, unsurprisingly, the largest religion in every Utah county and in chunks of Utah’s neighboring states. Islam is the largest non-Christian religion in the nation, claiming 20 states scattered mostly throughout the Midwest and South. In the West, Buddhism is the largest non-Christian religion in 13 states. Judaism is the largest non-Christian religion in 15 states, mostly in the Northeast. Hinduism reigns in two—Delaware and Arizona. And the Baha’i claim South Carolina. 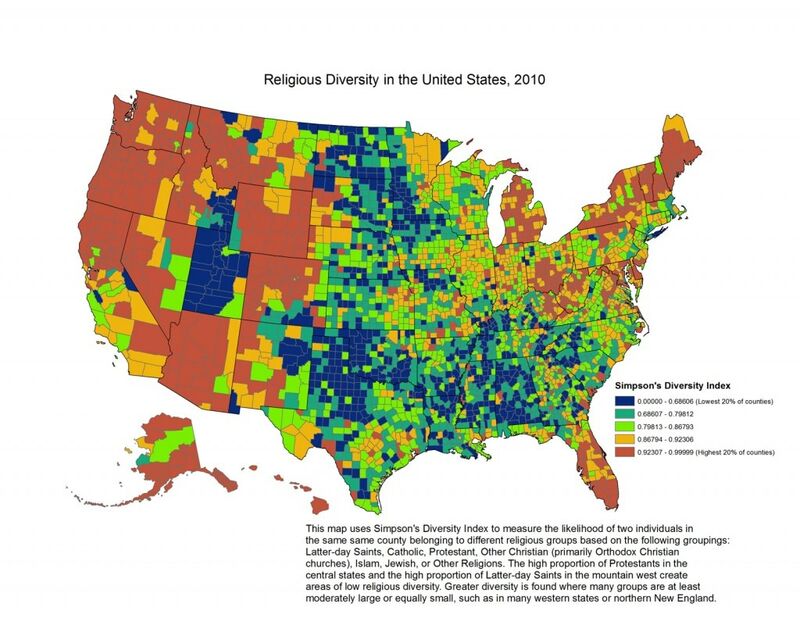 Brown and orange signify high diversity, while blue and blue-green signify those with very low religious diversity. Counties in many Western states and some New England states have high diversity, while there are pockets of low diversity throughout the middle of the country, Utah and the South. The counties with the highest rate of religious participation, with red being the most and white the lowest. Utah, the Midwest and parts of the South reign supreme. Religious participation was lowest in California’s Alpine County (4.3 percent), Hawaii’s Kalawao County (3.3 percent) and Nevada’s Esmeralda County (3.1 percent). The latter two have incredibly small populations, so are easily distorted by the religious inaction of a few. This table shows those counties with the highest number of congregations—defined as regular religious group meetings—per 10,000 people. The numbers were lowest in New York’s Bronx and Richmond counties, Michigan’s Macomb County and Nevada’s Clark County, where there were only four congregations per 10,000 people. Are secularists slackers when it comes to relief efforts? It should also be noted that not everyone who does good deeds — especially if they’re secular — feels the need to advertise their religion or ideology. We all do what we can regardless. That kind of canard is bruited about all the time, and a needed palliative for it has just been published in the Atlantic, in a piece by Katherine Stewart called, “A Catholic, a Baptist, and a secular humanist walk into a soup kitchen. . . ” It’s a good critique of the notion that only the religious help out in disasters—a notion that carries with it the idea that religion but not secular humanism promotes morality. Washington (CNN) – More than three in four of Americans say religion is losing its influence in the United States, according to a new survey, the highest such percentage in more than 40 years. A nearly identical percentage says that trend bodes ill for the country. According to the Gallup survey released Wednesday, 77% of Americans say religion is losing its influence. Since 1957, when the question was first asked, Americans’ perception of religion’s power has never been lower. The ultimate aim of the firm is to partner with Christian ministries and individuals to be a catalyst in moral and spiritual transformation in the United States. It accomplishes these outcomes by providing vision, information, evaluation and resources through a network of intimate partnerships. Given this goal, the Barna Group is considered a reliable and trustworthy source regarding Christianity — after all, since it wants assist fellow Christians in engaging with one another or reaching out to secularists, its imperative to provide only the most accurate information available. So, I thus far trust its conclusions, including the following study concerning America’s most secular cities. See where yours ranks (my hometown and current residence, Miami, Florida, is pretty high at 20th place). Barna Group tracks the following 15 metrics related to faith, which speak to the lack of Christian identity, belief and practice. Read more of Barna Group’s research on the “Nones,” secularization and post-Christian America. Interesting stuff, although perhaps not terribly surprising, as most of the cities are in regions well-known for their secularism (the Northeast and the West Coast). A number of large Southern and Midwestern cities weren’t far behind though. Meanwhile, the organization provides a list of the country’s most “Bible-minded” cities, based on an interesting metric: not only individuals who report reading the Bible in a typical week and who strongly assert the Bible is accurate in the principles it teaches. After all, many avowed atheists have read the Bible, while many pious Christians haven’t. By measuring both the knowledge and attitude toward the Bible, one can get a rough approximation of religiosity. On trend with much of the New England area, cities within the state of New York were on the lower end of the Bible-minded rankings. As for patterns in the three other most populous states, the research reveals the following. Florida: Though in the South, most of the major cities on the peninsula rank near the bottom middle of Bible-minded cities, including West Palm Beach (28%, ranked 53rd out of 96 markets), Tampa-St. Petersburg (27%, rank: 57), Orlando (25%, rank: 64), and Miami (24%, rank: 70). The exceptions to these patterns are in the northern part of the state, including Pensacola / Mobile (45%, rank: 13) and Jacksonville (41%, rank: 20). These two cities are more on trend with other Southern states and likely reflect more of a native Floridian or Southern population and fewer transplants than the Southern Florida cities. California: In addition to San Francisco being among the lowest rated, most of the major California cities are in the bottom third of the rankings. The Los Angeles media market represents a pretty normal range for California cities with 24% of the residents being Bible-minded (ranking 68th out of 96 cities,). San Diego (24%, rank: 74), Sacramento (24%, rank: 72), and Fresno / Visalia (25%, rank: 66) were also bunched in the same range. Bakersfield, CA stood out as being among the most Bible-minded cities in the Pacific states (39%, rank: 26). Texas: As part of the traditional “Bible belt,” Texas stayed fairly true to trend, with most of it’s major cities ranking in the top half of Bible-minded cities. Dallas / Fort Worth ranked as the top Bible-minded city in Texas (38% Bible-minded, ranking at 27th) over San Antonio (36%, rank: 33), Houston (32%, rank: 39) and Austin (29%, rank: 48). Notable exceptions to the Bible-mindedness of Texas cities were Harlingen / Weslaco / McAllen / Brownsville (28%, rank: 56), Waco (27%, 59), and most significantly El Paso (23%, rank: 80). These exceptions are likely a result of these markets having a higher percentage of Hispanic Catholics, who are less likely to engage the Bible. This didn’t surprise me. California is a large and diverse state with around 35 million people, and it’s long been split between it’s secular and liberal coastal and southern regions, and its more religious and conservative north and central ones. The influence of its large and typically pious Hispanic community can certainly be felt. Meanwhile, Florida and Texas are fast-growing traditionally conservative states that are receiving an influx of immigrants and northerners, many of whom are irreligious or non-Christian. Demographically, they’re also fairly young and urban, two features that characterize secularism in the United States. Even among the fast-growing Hispanic communities in these states, there’s been a growth in both irreligion and Evangelical Christianity. This state of transition is reflected in the fact that both of these traditionally conservative states have become “purple” politically, although established Republicans continue to maintain most of the political power. Among the nation’s largest 30 cities, 10 of them are in the top half of the Bible-minded market rankings, while 20 of them are in the bottom half. 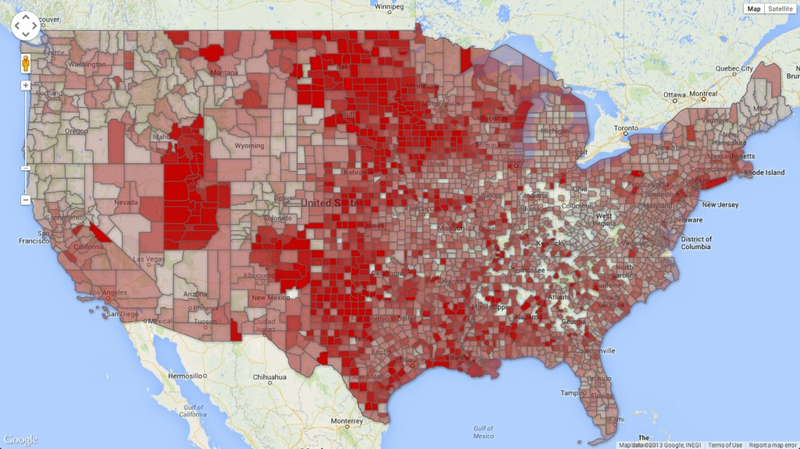 Generally speaking, the more densely populated areas tend to be less Bible oriented. Only three of the most Bible-minded cities are among the largest 30 cities—Charlotte (7th), Nashville, TN (14th) and Raleigh / Durham, NC (22nd). 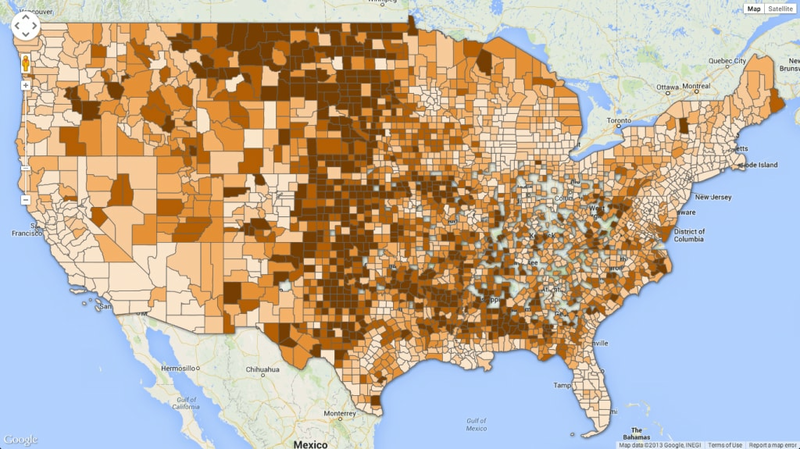 The other 22 top Bible-minded markets have fewer than 1 million households. Still, among the largest markets there are many more relatively Bible-minded cities, including Dallas / Fort Worth (27th), Atlanta (28th), Indianapolis (32nd), Houston (39th), St. Louis (41st), Cleveland (43rd) and Detroit (46th). Philadelphia (28%, rank: 52) is among the most Bible-minded cities along the eastern seaboard, ranking slightly higher than the aforementioned Northeastern cities as well as Washington, DC (25%, rank: 63) and Baltimore (26%, rank: 60). Chicago is the nation’s third largest city, and while it tends to be a bastion of many evangelical organizations, ranks between New York and Los Angeles in terms of Bible-mindedness (23%, rank: 76th). Colorado Springs, CO, which is also home to many Christian organizations, is right in the middle of the pack (29%, rank: 51st). By comparison, Denver is ranked lower (71st) with about one in four individual’s qualifying as Bible-minded (24%). In the Northwest portion of the country, the cities are all fairly similar, with about a quarter of the population being Bible-minded, including most notably Portland OR (25%, rank: 65th and Seattle, WA (24%, rank: 69th). I also find the commentary at the very end interesting, as it sounds like something out of a marketing agency (indeed, George Barna, the group’s founder, expressly stated that his aim was to provide “research and marketing expertise as a service to Christian ministry”). First, the large range of Bible-minded scores—from 52% in the highest markets to 9% in the lowest—shows just how diverse the nation’s population can be, from city to city. The rankings reflect an overall openness or resistance to the Bible, and in some markets half or more of the population claim to be open, while in other areas the proportion that is open to the Bible is more like one in ten adults. These gaps make a significant difference in the tone and tenor of conversations about Christianity, morals, public education, and spirituality, among many other topics. Second, although there are outliers—cities in which the Bible-minded rankings are significantly above- or below-average—the overall picture that is painted depends on one’s vantage point. The least sanguine way to analyze the results would be to emphasize the lack of Bible-mindedness in America; in 91 out of 96 markets a majority of the residents are not Bible minded. However, a more optimistic way to view those markets would be to look at those cities with at least one-fifth Bible-mindedness—meaning those areas where at least one out of five adults are open to engaging and esteeming the Bible. Among some researchers, this proportion—20%—is often thought to be something of a social or technological “tipping point” (for example, once one in five people had mobile phones, the momentum toward more people owning mobile phones began to grow exponentially). In this analysis, 83 out of 96 cities in the U.S. have at least 20% of their residents qualifying as Bible-minded. Christian leaders should recognize that most of the major cities in the nation continue to have basis for biblical engagement among a significant share of the population. As ministry leaders in particular, it’s important to keep both vantage points in tension. Whether you live in a city ranked in the top half of Bible-minded cities or in the bottom half of Bible-minded cities, there are still tens of thousands of people to reach regarding both the message of the Scriptures and their importance. However, no matter what type of city you live in, there is also a significant remnant of Bible-minded individuals. The key is to not merely “preach to those insiders” but instead to equip and empower those who do believe with a strong and relevant message to take out into their communities, vocations and spheres of influence. They are the tipping point and can have great influence on the greater city. Take all that as you will. Personally, I find it disquieting to speak of Christianity as if it were some product to sell, but of course, that’s not surprising given my own secularism.